Site Administrators are responsible for assigning phone numbers and phones to Users. Because Users won’t be able to place or receive calls until they’ve been assigned a phone number and a phone, this is a critical step. What is the User and device information I need to get started? How do I assign telephones/phone numbers to users? A. What is the User and device information do I need to get started? a) User’s name and email address. c) Telephone number to be assigned to the user. e) MAC address, also known as the serial number, which can be found on the box or on the back of the phone. i. the system automatically assigns the last four digits of the user’s phone number as the extension. ii. A bulk upload of this information is supported for Companies or Sites with a large number of Users. 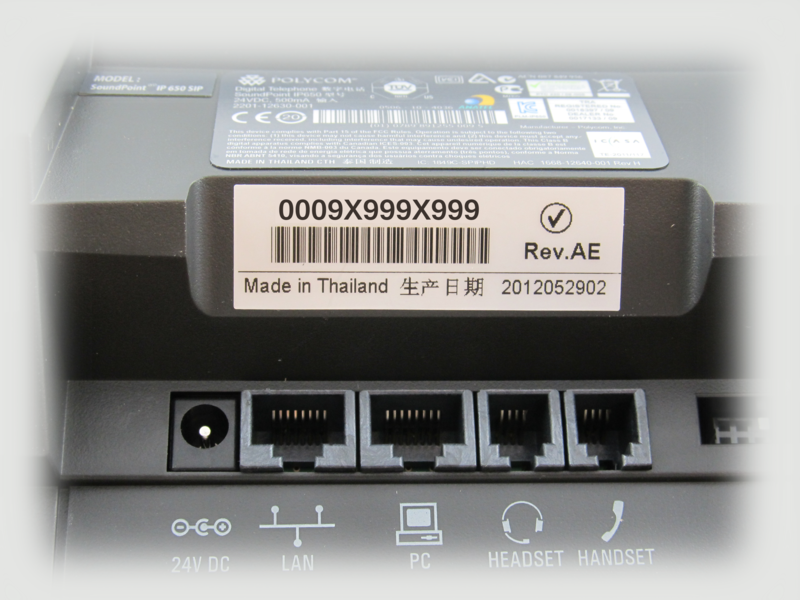 b) For ATA devices, the port number needs to change depending on the port number being assigned to the device. It will not always be one (1). Confirm the port number before assigning ATAs. B. How do I assign telephones/phone numbers to users? 1. Login to the My Account Portal. 2. Click the My Site tab. 3. Select a site from the list on the left. The My Site dashboard appears displaying quick links. 4. Click the Phone Assignments tab at the top of the screen. From here, you can assign phone numbers, modify extensions, assign phone to users, and modify the user’s first, last name, User ID and email. Phone Number – phone number associated with each user. Station – station type assigned to the user. Stations represent the features that the user receives. Extension – extension assigned to the user. By default, the last four digits of the phone number represent the extension. Model – Polycom phone model assigned to the user. MAC Address – MAC address assigned to the user; also known as the serial number. A unique series of letters and numbers representing that specific phone. This information is located on the back of the phone or on the box in which the phone was shipped. Port – indicates which port of the end-point device (phone or Analog Telephone Adapter, or ATA) with which the line is associated. For VoIP phones, this value is always 1. 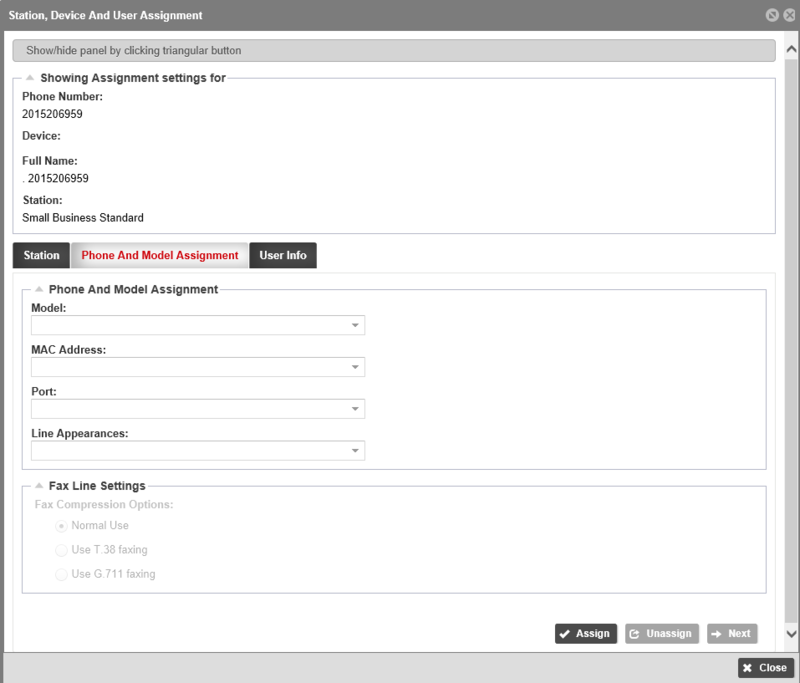 In the event an ATA is being used to provide an analog handoff (e.g., to a fax machine), the ATA has multiple ports available for assignment. If multiple lines are being applied to the same ATA, the first line assigned should be assigned to Port 1, then additional lines assigned to subsequent ports until exhausted. First Name – user’s first name. Last Name – user’s last name. 5. Double-click on the Phone Number to which you want to assign the station. The Station, Device and User Assignment pop-up appears. 2. Click Next to the Phone and Model Assignment tab. Note: You can only assign stations to Users who are active on your site. The Station Inventory Button shows you how many stations are available for assignment. 3. Select the phone model from the Model drop-down list. 4. Select the MAC Address. This must match the MAC address on the device you are assigning. 5. Select 1 from the Port drop-down list. 6. The system will determine whether the selected device can support multiple lines. If so, select the desired number of Line Appearances. 8. Click Next to advance to the User Info tab. 1. Click the User Info tab. 2. Enter the user’s First Name and Last Name. 3. Confirm the Caller ID Number. When placing calls to a Contact with Caller ID enabled, this number will appear on the receiver’s phone. To change the External Caller ID, select a number from the drop-down list. 4. Enter the User’s Extension. By default, it will be the last four digits of the assigned phone number. The extension can be 2 – 6 numeric digits. 5. Enter the User ID. The user will use this to log in to the My Phone portal. 6. Enter the user’s email address. This email address receives My Phone credentials and voice portal information. When passwords are modified, the user is notified at this address. 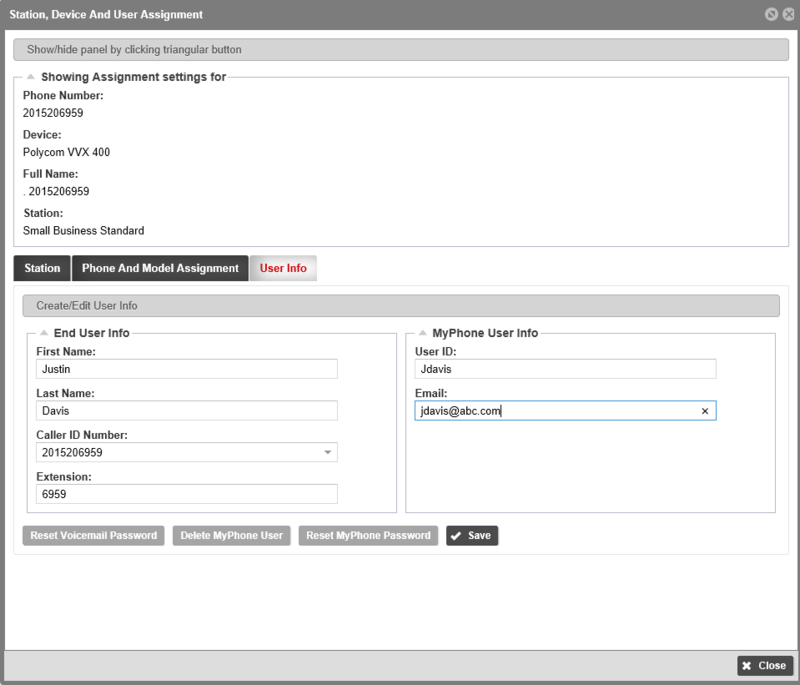 Note: This is required for a user to gain access to voicemail, and will grant them permissions to manage their own features from the My Phone portal. 8. Repeat these steps for each user.